Between state and federal sources, child care providers will be paid just under $74 million in the 2019 budget, up from $66.1 million in Fiscal Year 2018. “High quality child care is a basic right for every person, regardless of the neighborhood they grow up in, the color of their skin,” said Gov. 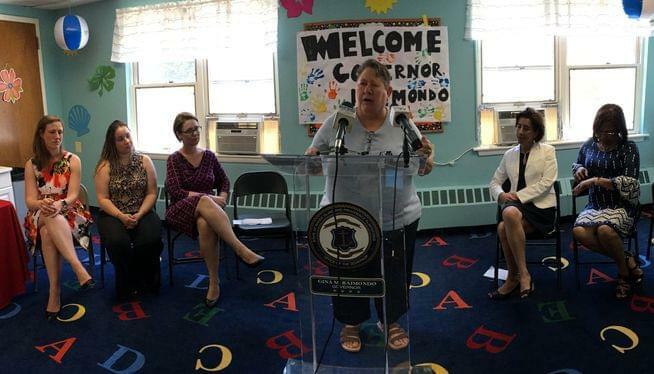 Gina Raimondo (D-RI) at a gathering in a Central Falls child care center billed as a ‘celebration’ of the newly enacted law providing for higher reimbursement rates. “I just have to express how profoundly this investment is going to make a difference in the lives of children and families and teachers,” said Margaret “Maggie” Teller, Chief Executive Officer of The Children’s Workshop, which runs the Central Falls Center and 20 other locations in Rhode Island and Massachusetts. “This is not a babysitting service we’re running here, it’s a child care quality education service that we’re running here,” said State Senator Elizabeth Crowley (D-Central Falls, Pawtucket), who said she has been trying for years to increase reimbursement rates. “Let’s make our state the richest state in the country because we are investing in our people and our children,” Crowley said.